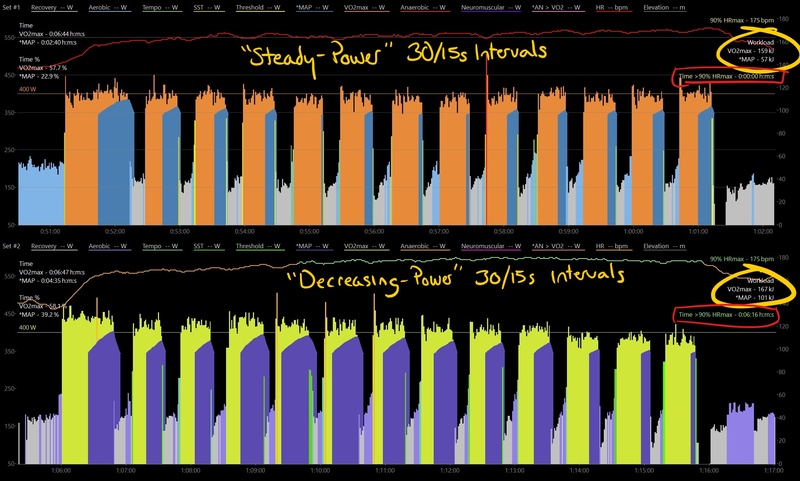 Just a cool comparison from my workout yesterday, that offers a chance to compare steady-power 30/15s intervals to decreasing-power 30/15s intervals. I set out to do 3x sets of my favourite VO2max workout, because with the vascular issue in my leg I’m scared of I can’t do more effective continuous power workouts. I wasn’t sure what my power target should be, since I haven’t done any proper VO2max intervals for a few months. So I set targets conservatively based on my current power-duration curve. 3×13 hard-start decreasing-power 30/15s… turned out to be waaay too easy. Immediately I could tell the power targets were too low, so as the intervals progressed I kept turning up the resistance to keep it hard. This unintentionally resulted in a fairly steady ~390-400 W power output for Set #1. Let’s compare Set #1 to Set #2, where I started with the resistance ~10% higher and allowed the power to decrease through the set. The first hard-start interval was at ~425 W and the final interval was ~380 W.
Colours are automatic.. don’t blame me if they clash! First thing to notice are the power bars. Orange in the top chart (Set #1) and Yellow in the bottom (Set #2). This is raw second-by-second power. In front of the power bars is a smoothed area of ‘MAP power’. Blue in Set #1, Purple in Set #2. This is a formula meant to estimate work done above 90% VO2max, using WKO4’s model for VO2max based on the power-duration curve. What are ‘work’ and ‘workload’? Work, in joules is the product of power (watts) multiplied by the time (seconds) that power was held. Workload, in kilojoules is then simply the cumulative work done for the given interval. MAP workload estimates the work done above 90% VO2max, which is really the number that counts for a VO2max workout. Blue in the top chart, purple in the bottom. The MAP expression tries to account for the slower ramp-up time of VO2 when each VO2max interval is initiated, so you can see by the coverage of each area over the power bars that not all of the VO2max workload is contributing to the MAP workload. The first part of each work interval is spent just ramping VO2 back up to 90%, before work can be accumulated above this target. This is why the comparison between sets is so interesting! While both VO2max workloads are within 5%, MAP workload shows a massive ~43% difference! Using intermittent intervals like the 30/15s and knowing the MAP formula, I could probably design a workout that would game it to maximize MAP workload, but the formula is just an approximation. As a model, it’s sure to be wrong… but it is useful. I’ll leave this with a sneak peak of a chart I’ve been working on that attempts to model VO2max training load using the MAP workload algorithm. It then tracks it in a PMC-like chart with Chronic and Acute training loads.